Above: Jared and Richard Chavez at their San Felipe Pueblo home studio. IN A STATE WHERE BOLOS RUN neck and neck with regular ties, a bolo made by San Felipe Pueblo jeweler Richard Chavez sticks out like a Rolls Royce at the rodeo. For over four decades, he has practiced a style that blends Native stonework with a modernist aesthetic derived from an almost century-old European art movement. His bolos, shaped like hovering hummingbirds, butterflies, and sacred figures, have earned him numerous awards and fetch prices in the thousands. Beginning next February, the Heard will host a retrospective of Chavez’s work—only the sixth such solo jewelry show in 46 years. And this month marks his 43rd appearance at the Santa Fe Indian Market. 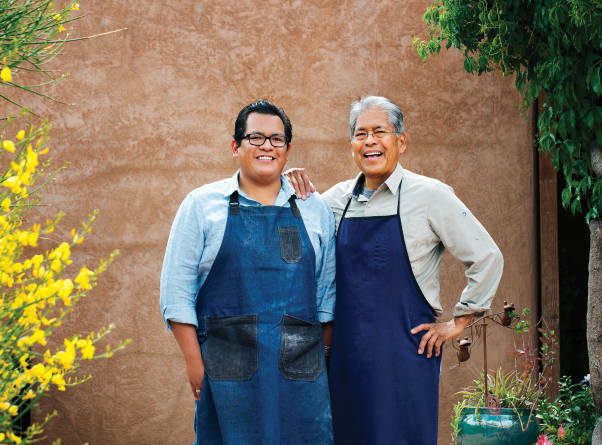 In New Mexico, where many bolo makers stick to a common stamped-silver-and-turquoise formula, artists like Richard Chavez push the artistic possibilities of the accessory. Pardue calls him a role model for younger jewelers, a distinction that applies especially to his son, Jared, an accomplished craftsman who works side by side in the studio with his father. IT&apos;S ALL A FAR CRY from where the elder Chavez started decades ago, delicately crafting heishi, tube-shaped beads of shell or stone, at his kitchen table for extra money while he worked as an architectural draftsman. Whenever dinner was ready, he reluctantly disassembled his makeshift workshop to clear space for the meal. Eventually, a wave of imported knockoffs saturated the market, and in 1976, he decided to leave the beads and drafting behind. He checked out John Adair’s Navajo and Pueblo Silversmiths from the library and set to work as a full-time maker of necklaces, bracelets, rings, belt buckles, and bolos. At his first juried exhibition, he surprised even himself by winning the top prize. His stone-inlay work stood out then, as it does now, partly because it reflects the influence of Bauhaus design. “The modern part comes from the architect I used to work for,” he says, referring to Harvey Hoshour, who designed extensive additions to Albuquerque’s First Unitarian Church in 1964. Hoshour was himself a student of Ludwig Mies van der Rohe, who led the Bauhaus school in the early 1930s before it succumbed to pressure from Germany’s Nazi government in 1933. Bauhaus proponents espoused a creed of craftsmanship, hoping to reunite artistry with manufacturing following what they viewed as the depersonalization that occurred during the industrial revolution. Each Richard Chavez piece emphasizes shape and shade, pairing bold, balanced hues with clean, natural outlines. He undertakes a 10-step process of selecting and cutting his own stones before laying them out with a designer’s eye for fit, balance, and color. Jared grew up in the studio. At age 10, he complained that he was bored, so Richard sat him on his knee and began teaching him. Jared later studied studio art and digital media at Georgetown University. When he graduated in 2005, he decided to dive into jewelry making, but Richard insisted that he get the formal training the elder Chavez never had. Jared studied at the Revere Academy of Jewelry Arts in San Francisco, and when he returned, Chavez Studio was created. “I think it was my first attempt at inlay,” Jared says, remembering his first bolo tie, with a stamped-silver bottom and stone-covered top. It looked like one of his father’s designs. Eventually, his personal style evolved: a central gem—mottled green-and-brown grasshopper turquoise or swirly Peruvian crater agate, for example—surrounded by intricate silver line work he calls linear inlay, a painstaking process of soldering thin wisps of metal into a complex spider-web filigree. IT TAKES RICHARD AND JARED each about two weeks to make a custom bolo out of carefully chosen black jade, fossilized mammoth tusk, or other choice materials. Richard still designs on drafting paper, a holdover from his time in architecture, while Jared mostly works on a computer. Richard’s bolos are focused on stonework and “not overly done,” he says. Jared’s work is defined by his ever more complex metal line pieces. Lately, they’ve collaborated on necklaces, with Richard’s careful lapidary nestled within Jared’s dazzling lattices, and they recently started making bolos and buckles together. The studio Richard built to keep his work off the kitchen table feels bright and organized, even as Jared’s young son, Max, occasionally toddles in to watch his father and grandfather work. Over the years, Richard’s wife, Sharon, and their daughters, Cynthia and Alissa, have used the studio to make pottery, too. Richard doesn’t have the space to himself anymore, but he relishes the company and the chance to create new designs alongside the next generation. “We have a lot of input on each other’s process,” Jared says. Bolos—also called bolas and string ties—create a distinctive and versatile Southwestern look. “They really attract attention,” says Heard Museum curator Diana Pardue. “They can make a statement.” She should know. Along with Chicago-based collector Norman L. Sandfield, she wrote the book on bolos, Native American Bolo Ties: Vintage and Contemporary Artistry (Museum of New Mexico Press, 2011). It grew from a 300-piece exhibit of the same name organized by the museum and shown in Phoenix, Albuquerque, and Oklahoma City between 2012 and 2016. “I just have a problem with that story,” Sandfield says. “While he was a jeweler, the design is so specific that I don’t think it came out of thin air.” In fact, he says, Navajo, Zuni, and Pueblo people were fashioning scarf slides from sheep vertebrae and metal long before Cedarstaff submitted his patent. In the 1930s, a decade before Cedarstaff’s anecdotal discovery, silver-screen cowboys were lacing together their stampede strings (leather cords used to keep hats in place) with exotic-looking slides. An 1898 photo of Cheyenne chief Wolf Robe shows him wearing a bolo-like slide made from a U.S. peace medal. Whatever their background, it’s a style born in the Southwest and suitable for any occasion. Bolos are popular among Natives, Anglos, and Hispanos across the West. They hold the honor of being New Mexico’s official neckwear, and Arizona’s and Texas’, too. As for the continuing appeal of the tie, Chavez Studio clients agree that it’s a matter of personal expression—and versatility. In New York they like to dress them up, making them the highlights of otherwise staid suits. In Los Angeles, they cinch them under the collars of polo shirts. In New Mexico, politicians wear them while on official business, and regular folks like them because they fit the Southwest’s casual feel. “It’s dressy but it’s not. It depends how you wear it,” Jared Chavez says.